1. The selected candidates shall be engaged at consolidated salary Bs. 12,000/- per Month. 2. The services of the persons so engaged Shall cease automatically on the expiry of the term without providing any claim for the regularization of services or any consequential benefits. 3. The person so engaged shall be required to execute a SERVICE AGREEMENT BOND on non-judicial stamp paper duly signed and attested by the Executive Magistrate 1st Class. 4. No TA/DA will be paid to the candidates for appearing In the interview. 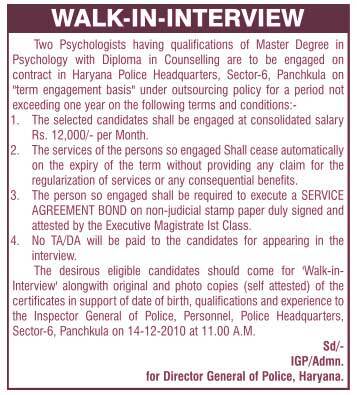 The desirous eligible candidates should come for Walk-in-Interview along with original and photo copies (self attested) of the certificates in support of date of birth, qualifications and experience to the Inspector General of Police. Personnel, Police Headquarters, Sector-6, Panchkula on 14-12-2010 at 11.00 A.M.